Andrew Mitchell faces a £3million legal bill today after a judge ruled he did call Downing Street police officers 'f****** plebs' because they refused to let him through the main gates on his bike. The former Government chief whip could face political and financial ruin after he lost his High Court libel action over the infamous 'Plebgate' incident in 2012. Mr Justice Mitting decided that the police officer he abused, PC Toby Rowland, lacked the 'wit' or 'imagination' to 'invent' the 'toxic' words the Tory MP said to him. The judge also rejected 'absurd' claims by millionaire Mr Mitchell that the three police officers stood at the Downing Street gates conspired to discredit him. After the ruling, Mr Mitchell said he was 'bitterly disappointed' with the outcome but did not apologise. Giving his ruling, the judge said: 'I am satisfied at least on the balance of probabilities that Mr Mitchell did speak the words alleged or something so close to them as to amount to the same including the politically toxic word pleb'. He added Pc Rowland was 'not the sort of man who would have had the wit, imagination or inclination to invent on the spur of the moment an account of what a senior politician had said to him in temper'. 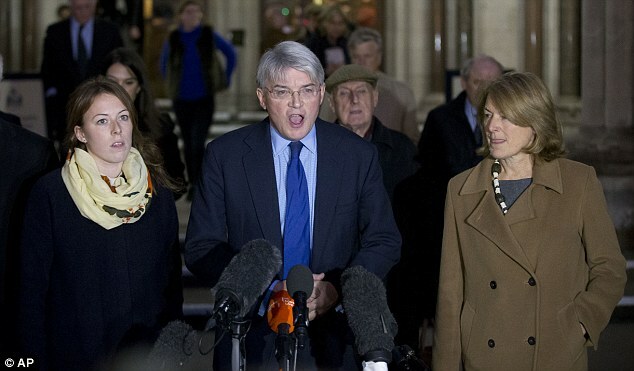 The Tory MP for Sutton Coldfield listened to the High Court judgment flanked by his wife and children and fellow MP David Davis, and looked stunned when he lost. Outside after the ruling he did not apologise but said: 'Obviously I’m bitterly disappointed by the result of the judgement today. This has been a miserable two years. But we now need to bring this matter to a close and to move on with our lives. 'I want to thank all my friends, in the international development community, my constituents, for their loyalty and support during the last two years.